No country wants to be left behind in the global economy, yet the competition among nations grows ever more demanding. New waves of technology (the Internet of Things, cloud, big data, HDTV…) require more and better broadband. This means that government and regulatory authorities must find ways to create policies that will spur successful initiatives. The good news is that 148 countries already have implemented broadband programs and are reaping the rewards. However, 57% of the world’s population still don’t enjoy internet access today. So what can policy makers do to set the stage for universal, affordable and sustainable broadband? What program works and what doesn’t? 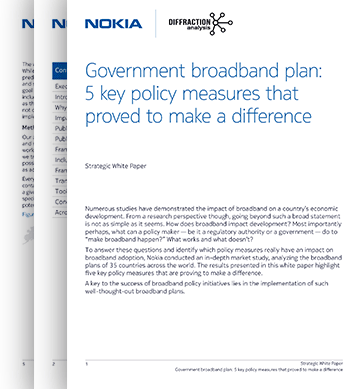 To answer those questions, Nokia commissioned an in-depth market study by Diffraction Analysis, examining the broadband policies of 35 countries across the world with regard to their impact on availability, affordability, quality and adoption. I’m pleased to share the results, presented in this study report: Discover the 5 key policy measures that positively impact on broadband service availability, affordability, quality and adoption. It delves in-depth into each successful policy, and examines how transformational projects within a coherent plan can transform a nation’s broadband market structure for the long term, delivering big benefits over time. Any successful national broadband policy requires a well-thought-out plan. That core reality makes this study an essential read for government representatives and policy makers everywhere who want to understand the strategies, the practices and the tools that will help assure broadband success and the economic benefits that follow. I invite you to use this report to kickstart discussion on the right topics in your country to help guide a successful strategy. Nokia is keen to collaborate, share projects and generate additional ideas for enriching this tool box. Our joint efforts will benefit the entire community. Watch the 2 minute video summary about the study here. Olivier leads Nokia’s efforts in the go-to-market solutions for government initiatives, which encompass government-driven broadband Initiatives, modernization of administration networks, government cloud, smart cities, etc. He has a background in public affairs and implementing information and communications technology (ICT) infrastructure for national, regional and local governments.